We gridded the isopach map of the Cambrian silty dolomites, dolomitic sandstones, and shales of the Eau Claire Formation from Catacosinos and others (1986) (c7mtsimong). Overlying low-permeability carbonate units may also retard upward communication. 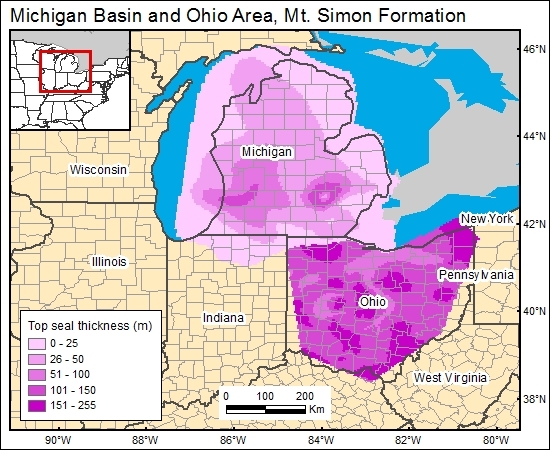 Catacosinos, P. A., Harrison, W. B., III, and Daniels, P. A., Jr., 1991, Structure, stratigraphy, and petroleum geology of the Michigan Basin, Chapter 30, in Leighton, M. W., Kolata D. R., Oltz, D. F., and Eidel, J. J., eds., Interior cratonic basins: American Association of Petroleum Geologists Memoir 51, p. 561–601.